eat, drink & be vegan: Super-Charge Me Cookies! These new Super-Charge Me Cookies for Eat, Drink, and Be Vegan were inspired by our daughter's first soccer league game. It was an event day with prizes and games, and after all the teams played they handed out these enormous pre-wrapped cookies to all of the girls. Our daughter didn’t eat hers but I looked at the cookie after the game. Here's the cookie, with a Canadian quarter on top for comparison. Full of sugar, shortening (hydrogenated oils), and - well - junk, it weighed 1/4 lb!!! In our culture of ‘super-sizing’ everything, even our daughter was in the mix of these girls eating super-sized cookies – quite unfortunate after such a healthy sporting event. Plus, it's no wonder a child wouldn't want to eat a decent dinner after eating a cookie that is the caloric equivalent of a meal but with no nutritional value. I'm all for our kids enjoying treats, but with 530 calories, 25 grams of fat (7 of them trans fat) this cookie was ridiculous. I thought "we don’t need to super-size our kids’ food… we need to super-charge it!" 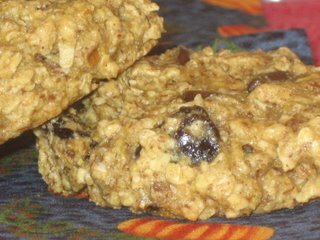 Hence, the creation of these nutrient-packed cookies, full of oats, flax meal, almond butter, raisins, and other goodness! What? I'm the first comment? WOW! I will probably comment a few times. First, I wanted to swing by and see if you had any input or thought on today's post (on my blog). Okay. Now that I have wiped the drool off of my mouth - these cookies sure do beat the heck out of the super sized ones. I'm still trying to master the baking - you are my spot check and inspiration. Again, can't wait for the new book. Your version is waaaay better. And you're right, filled with good stuff not loaded with junk. I cannot get over 530kcal, 25g fat?!? That is crazy. And sad. Unfortunately, crazy snacks after every sports game seem to be the norm lately, at least where I live. Even when the kids didn't put forth that much exertion (say, 6 year olds' baseball) there is a huge expectation of a junky snack. Same is true for Scout meetings too. I don't remember these things being all about the food when I was younger. Your cookies look great, though! It must be so frustrating to be a mother and always be faced with people giving your children this sort of junk. Here they think they are being kind and generous..and while they are, they are also being inconsiderate and harmful!!! That is one big cookie. I'm surprised it fit in a little one's hand. Your cookies on the other hand look delish. I remember when my brother played football my sister who helped out would often bake muffins or bring orange slices. That made for a nice treat. Speaking of snacks after sporting events...my Hubby recently ran in the Terry Fox 10K marathon in Burlingon. Afterwards, an orange drink from McD's was handed out along with cookies and get this -- HOT DOGS!!!!! I was so surprised. Aren't hot dogs linked with causing cancer? Plus, people don't need hot dogs after running. I find it strange that people focus on raising money for such charities to "cure" these diseases but often forget that sometimes lifestyle choices go a long way. Okay. I totally went off topic. Forgive me. Oh I do remember those days when we all took turns bringing snack after sports games. Girls always asked their parents to bring donuts. It was that and a capri sun. Although I do remember some parents bringing orange slices- which I also enjoyed (so kids will go for healthier snacks even if they're used to the junk). But man I think that cookie your daughter got tops them all. The cookie that you've made looks ways better anyways (besides being a billion times healthier). I hope that you bring them to her next game and share with her teammates so that they can try some healthy treats. I hope that your daughter is enjoying soccer... I've been playing since I was 5. Wow, what a disgusting "treat" for those girls. Yeesh. I'm making your Cannellini Bean Yam Hummus for our official grand opening tomorrow night. It will be served with Vive displayed next to it. I'm really excited, any way I can get Jim to eat yams, I'm all over it! there's a cookie i'd like to see my girls bite into! Holy cow! I can't get over the 530 calories! That's insane. I hate to sound like an old fart but back in the day when I played soccer as a kid we always had oranges as a snack (of course that was in South Florida where citrus is plentiful). Your cookies look so much better! We love the cookie recipes in Vive and can't wait for the next book. Oh yeah, what happened to the oranges? Chris, you're not an old fart... My little brother (now 24) had oranges and I remember going to games and getting some too even though I didn't play. 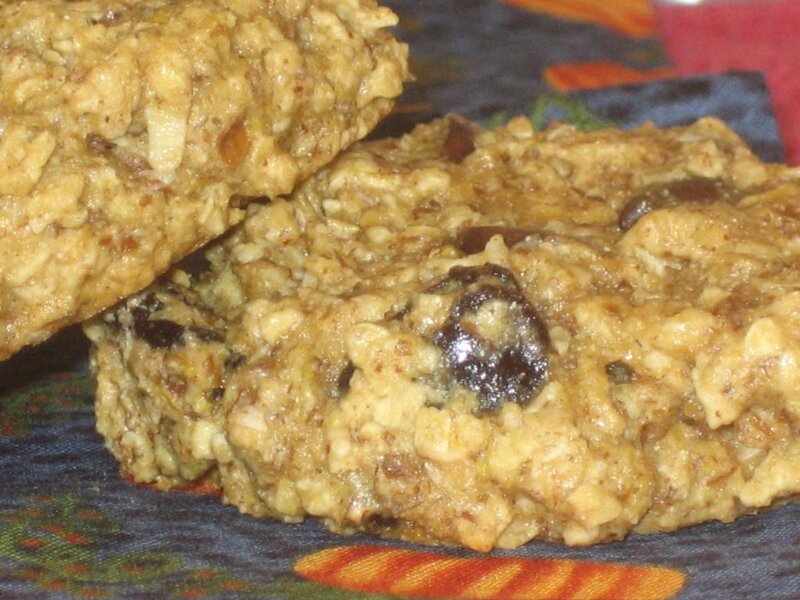 What could be better than an oatmealish/raisin/almond butter cookie?? I'll take your version any day! That horrible cookie- good for your daughter to be able to pass it up. I know a lot of adults who would eat it, and then feel like crap! SO true - I couldn't even get through supersized chocolate bars when I was pregnant - and that is saying something! Thank you so much for the tips on the moroccan chickpea patties - they have worked - and are our tucker for tonight! Hey Harmonia - I think we each have a cupboard just for tea alone, hey?? Do you drink much rooibos - as you know, it's one of my favorites. Have you ever had the Yerba Mate? I can't get past the taste of it, but it's supposed to be quite healthful. Les, it's nuts actually. I mean, it's like giving a kid two or three desserts (full of junk) before dinner!! Amy, we associate just about everything in our culture with food. I'm not at all opposed to associating fun or sporting events with fun or refreshments, but they should be a little more geared to healthy eating - esp for sports. We do have orange wedges for the kids for the break during the game, which is very good!! (and, the kids LOVE them because they are so juicy and refreshing). Megan, we are bombarded with it... school, parties, play dates, and even sports. That's why it's so important for kids to value what food is and where it comes from and why we eat what we eat... so they understand that some things are just not good to put in our bodies, and harmful to animals too. When they know that, they don't want that food - yes, they still want treats, but we can make delish treats without all that stuff!! Hi Teresa! Well, she DOES love soccer - she is usually quite a 'go-getter' out there. I love that she is embracing it, though as a summer-lovin' mom, I'm not looking forward to the winter games in the cold and wet outdoors-brrrr!!! They do have orange wedges in the game - thankfully, and our team agreed that we would keep the food to just that without coordinating other snacks. I think the parents were probably relieved about that! Playing soccer since you were five - cool!!! Are you on a team now? Vicki, your girls - well esp your older girl, might be great 'testers' for these cookies... I'll get in touch with you when I iron out the recipe for keeps and see if you want to try them out! Hi Chris, thanks! No, you don't sound like an old fart, I think that we are all just too needing to please our kids with everything these days and so sugary junky fatty salty treats are thrown into the mix most of the time. I'm sure with how active you are and all the training you do, this honkin' 530 cal junk-ridden cookie after some good physical activity sounds comical - or horrifying! Hi again Les! I guess the orange thing is quite universal! It's our first year with soccer (well the league anyhow), and right away everyone was talking about the oranges - I had no idea oranges had such a connection to soccer everywhere! Hey Melissa, it's great to see you back again! :) Thanks!! Hi mum! (that sounds so cute)!! Yayyy, I'm glad the tips helped you out. I tend towards more tender, softer patties in general because I usually serve them on their own with a sauce and a side dish. If ever you want to firm up patties, adding cooked grains like rice will help, or some quick oats, or bread crumbs. If they are crumbly and need to "stick", then a tbsp or two of tahini or nut butter will help (also miso helps - but it can make them very salty so you have to add a little and test as you go). The recipe for "Celebrity Adzuki Bean and Rice Cakes" is a firmer patty, fyi, if you want to try them sometime - and you don't have to make the yellow pepper sauce for them if you don't want to - these are good just as they are or in a pita or tortilla with some fixins! :) I'll stop rambling now...!! 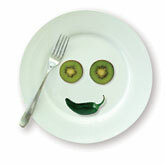 Speaking of healthy - I am wondering what vegan hot breakfast dishes anyone would recommend for a large group? Our school does a monthly breakfast for all the teachers, and it is my grade level's turn to do it this month. 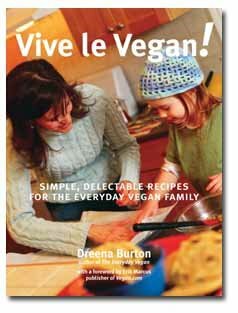 I would like to "wow" everyone with a yummy vegan dish that is hot, and perhaps one that I can prepare the night before and bake or reheat in the morning? Thank you in advance! Oh- and everytime I make vegan cookies, especially Dreena's people are drooling, so I have a lot to live up to! 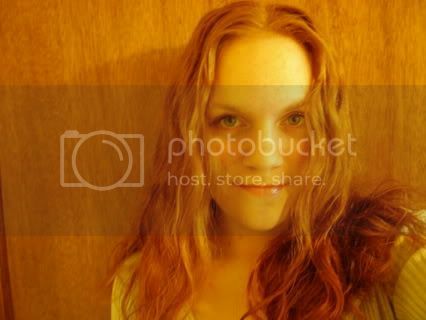 My picture is about 6 or 7 years old. When my husband and I were a new couple, we planted our first garden, and planted these weird radishes that were white and pink spirals on the inside. 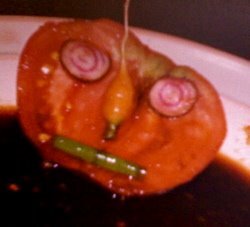 This "Ms. Tomato-head" is a salad from that garden- tomato head, radish eyes, mini-carrot nose, green onion mouth, swimming in a balsamic bath-you were very close! Don't suspersize. Dreenasize. They even tasted good when I licked the screen. I love this, Dreena! Supermom to the rescue once again! These look and sound yummy! Waay better that the other ones! It amazes me how much fat(trans and saturated) they can jam into cookies now. I know yours are much,much healthier and nutrition-packed! Dreena - we have the celebrity adzuki cakes as a staple - my son eats them frozen!!!! Your cookies look better all around. Good for you Dreena! Get mad and get even! Beat them at their own game! I *totally* agree with you. One time my daughter got a treat bag from the library for reading a certain number of books. I was flabergasted at what was inside - a chocolate covered granola bar (chocolate bar in disguise) and a package of powdered hot chocolate. Why do they do this to our children? Can't wait for the new cook book. Those cookies look delicious. Anyhow, I like chocolate chip cookies as much as the next person, but not a giant, fat-full gross thing like that. And you know, those types of things don't even taste good. They're all chemically. ICK! Anyhow, a vegan internet friend of mine is visiting Canada for the first time and we're taking him to Niagara Falls today. For snacks I'm packing fresh Ontario apples, Dreena's Apple Hemp Muffins, and Dreena's Coconut Pineapple Carrot macaroons. I'm sure we'll all be much more satisfied than we would be with a humungo factory made cookie. Dreena rocks again! 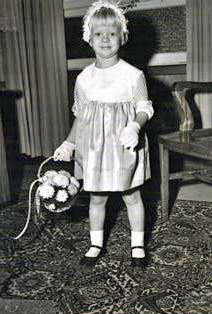 Dreena, Off topic...what are you serving for Thanksgiving Day? If I remember correctly you once mentioned a good holiday meal and I'm not sure if it was on your blog or in your cookbooks. I'm looking for a good side dish to bring to family get togethers. I'd like to say that I'm surprised about the calories and fat (and low nutritional comment) but in our society, it's certainly not surprising anymore. It's really sad that there is a company manufacturing these and it's even sadder that there's a governing board of parents who think these are great after soccer snacks. I think about having kids frequently. I don't want any, but that doesn't mean that I don't think about what my life would be like with them. One thing that bothers me is that my children would be bombarded with junk food all day. It must be very difficult for children not to be swayed by peer pressure. I don't think I would be able to ever let me kids leave the house! I love Rooibos! Yerba Mate...there is one I like so far and I forget the name...but I tried a vanilla one and didn't like it at all! Blah! Oh! I responded to your comment on my blog this morning, too! Hi Mrs. Carlson... hmmm, it looks like you didn't get many responses here - I will post the question for you in a post and see if you get some help that way. Other than pancakes, I might go for something like a warm sweet rice casserole. Almost like a rice pudding that is heated in dish, and topped with some chopped nuts and/or dried fruit. I don't have a specific recipe for you for that though... we'll see what these fabulous bloggers have to say!! Bazu, close, but no cookie. :) Dang, thought I had that one (alright, you'll have to come up with another sometime down the road and give me another challenge)!! Hi Savanna, thanks! 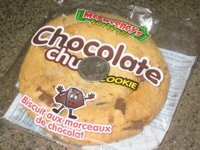 Yup, kinda crazy how much junk is in that one cookie - but then it is 1/4 lb!! Chris, I was surprised to hear everyone mention it - and if we are doing it in 5-yr old soccer in BC and you did it in Florida, I guess there is a definite connection. My parents-in-law spend time in Florida every year and they talk about how people just give away all types of citrus in bins at the end of their driveway when it is so plentiful - how neat is that! Carrie, YES, those muffins - er cakes... I've seen people buy the big 'flats' of them and my goodness, they are absolutely cakes disguised as muffins. I'm sure people know that, but they want to believe something different. How lovely are you, packing up such nourishing goodies for your outing - and how FABULOUS that you get to take your friend to Niagara Falls!! Nice. Hi Vivacious, yes, it can be discouraging at times, but also very encouraging as a parent to see that the positive, healthful messages we are bringing into our childrens' lives are having an impact and will (hopefully) carry through more generations. Our older daughter always says things like "don't worry mom, I'll take care of all the junk food stores when I'm older" or "I'll teach people not to eat meat". She already has a very good sense of what food *should* be, not what many kids are eating - processed, refined, 'unreal' foods that are probably more synthetic than having anything real in them. She also understands why we don't eat dairy and eggs and meat, and has made the connection, so I feel encouraged about that. It IS always an issue whenever there is a social event, though. Oh, and yeah, they do have orange slices for the break in the game (thank goodness), and our team opted out of doing snacks apart from the oranges (double thank goodness)!! 'morning, Harmonia! Yes, I tried a vanilla yerba mate too, and it tasted like smoke or something. I don't think I'll acquire a taste for that one!! Thanks Dreena! That's what I had in mind. Have a good Thanksgiving if I don't write before then. 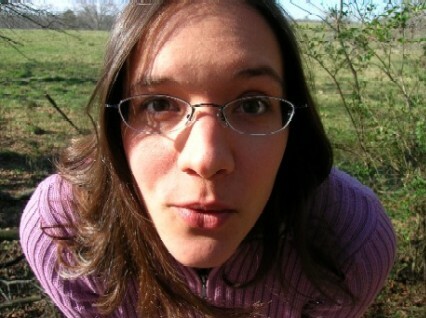 Me again. I was wondering if one could "cheat" with the phyllo mushroom pie and use a premade pie crust to save time. Sweet Pea, I think it would be just fine - I'm not sure how much filling it would make in terms of the pie crust - I think for sure it would make enough, I don't know if there would be excess, but the pie could always be quite 'stuffed'! The filling is on the hearty side with the potatoes, and so I like using the phyllo to lighten it somewhat. Though, if you are serving it in a pie crust you could simply cut smaller portions, and it sounds like a very nice variation. Let me know if you do decide to make it how it turned out! How many calories in a super-charge me cookie?